Organize visible storage areas with the Weave collection. These Weave Storage items combine style and function; the trendy look of weave with the convenience, durability and value of plastic to provide a variety of décor solutions for your living spaces. 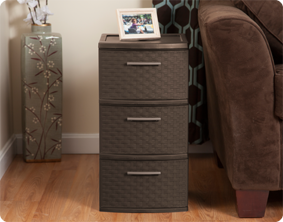 The 3 Drawer Weave Tower takes on a furniture-like look and is ideal for “out in the open” storage needs. Three opaque drawers keep clutter controlled and concealed while providing access to frequently used items, where they are most often used. The easy pull handles allow drawers to open and close effortlessly, with a drawer stop to prevent drawers from being removed accidently. The overall dimensions for this item are 15" x 12 5/8" x 24". Overall Assembled Size: 15" x 12 5/8" x 24"
Versatile decorative storage solution is ideal for use throughout the home. 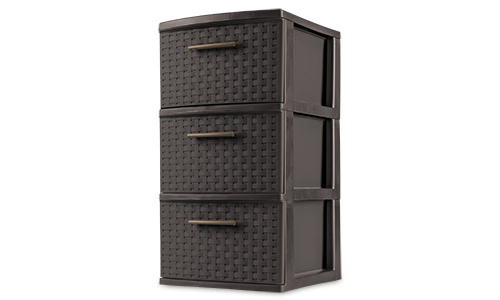 3 Drawer Weave Tower is rated 5.0 out of 5 by 6. Rated 5 out of 5 by shreddedwheat from convienient small size while holding lots of items it is perfect small size for my bathroom. though small , it is a sound , firm product, easy to use. it is not a flimsy fall apart product most companies fool us into buying. it holds lots of items, even heavy books and magazines. though they add lots of weight the drawers slide easily.. my only wish is they should be supplied with the 4 wheels. the cabinet is precast with a place for the wheels. where are the wheels? Rated 5 out of 5 by Bevita from Brown weave is awesome, opaque is stylish. I got the brown weave to put under my desk to serve as drawers, I was more than pleased. Rated 5 out of 5 by Josh from This product has great features, but I would like it on rollers or some form of feet. I like the dark color because you can not see what is in the drawers. It is easy to clean and looks nice in a room. The only thing wrong is, I would like to have the Tower on rollers or some form of feet which they did not come with. I would buy some rollers, but I can not find any that fit the Tower. Rated 5 out of 5 by CROBUTKA from Weave Drawer Unit What a great addition to any room. looks very decorative. is well made, strong. i like the handles on the drawers, very attractive. holds a lot of stuff. i use it in my craft room but it can be used almost anywhere. would love to see some antiquing in the color on the brown but it looks wonderful the way it is. 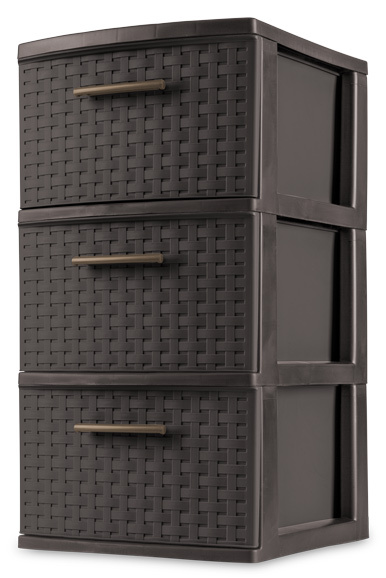 Rated 5 out of 5 by mitney from Classy Looking Tower This 3 drawer weave cabinet looks very good in my home office. The weave design makes the cabinet look like wood and the long sleek handles help to give it a classic look. The only thing I can say negative about this product is that it might not be the size for you if your looking to store legal size paper or envelopes etc. as the draws themselves are not quite long enough. Overall product is well made and durable.